total available Jobs are 13. Application in a prescribed format only will be received for these Junior Assistant jobs of Jorhat district. Candidates will be selected based on their marks in written exam only for these Jorhat district Junior Assistant jobs. 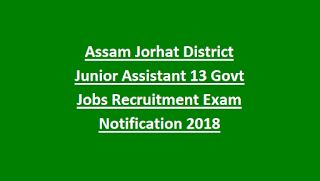 Last date for submission application form for this Junior Assistant jobs of Jorhat District is 03-10-2018. 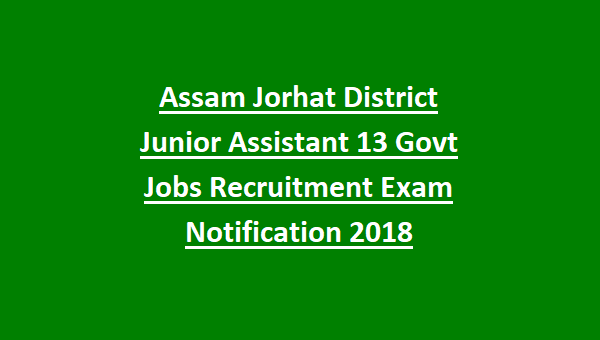 Complete details of this Jorhat District deputy commissioner officer vacancies of Junior Assistant Exam Pattern, application fee and other information is furnished below. 03-October, 2018 up to 5.00 PM. As per Notification of Jorhat District, total available Junior Assistants Jobs are 20. Candidates must have qualified Degree exam and should have at least 6 months computer training knowledge certificate. It is mandatory of having working knowledge of office productivity software tools such as MS Office, Linux OS, Email, internet and database concepts. Selected candidates will receive monthly salary of Rs.14000/- to Rs.49,000/- with Grade Pay of Rs.6200/- plus other allowances. Age Limit will be 18-43 years and for reserved candidates upper age limit is 48 years based on state Government services as on 01st January, 2018. Candidates will have to appear for written test and Practical Computer Skill Test. Written test will be held for 250 marks. And computer knowledge skill test will be conducted for 50 marks. Application in a prescribed format to be submitted to Deputy Commissioner of Jorhat District on or before the closing date of 03-10-2018 along with all required documents.